David Clark's commercial litigation practice has included a broad range of clients and issues in state and federal court, arbitration and regulatory agencies. He has substantial trial experience in complex commercial, product liability, securities, insurance, trademark, antitrust and unfair competition, contract, lender liability, franchise, telecommunications and banking litigation. David has been recognized as a national leader in civil justice reform by the American Tort Reform Association, who has named him a Legal Reform Champion. For more information, go to LRC website. David is listed in The Best Lawyers in America and Mississippi Super Lawyers in the field of Business Litigation. He has been the State Delegate for Mississippi in the ABA House of Delegates, Chair of the ABA Standing Committee on Gun Violence, on the Council of the ABA's Section of Litigation, on the Council of the ABA Fund for Justice and Education, a past Chair of the Mississippi Bar's Litigation Section, and a member of the American Law Institute. 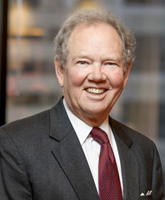 He has taught or written on antitrust law, federal courts, discovery, mediation, and tort reform. American Tort Reform Association, "Legal Reform Champion"